1. Assumptions and opinions don’t increase opens and clicks—but testing them does. 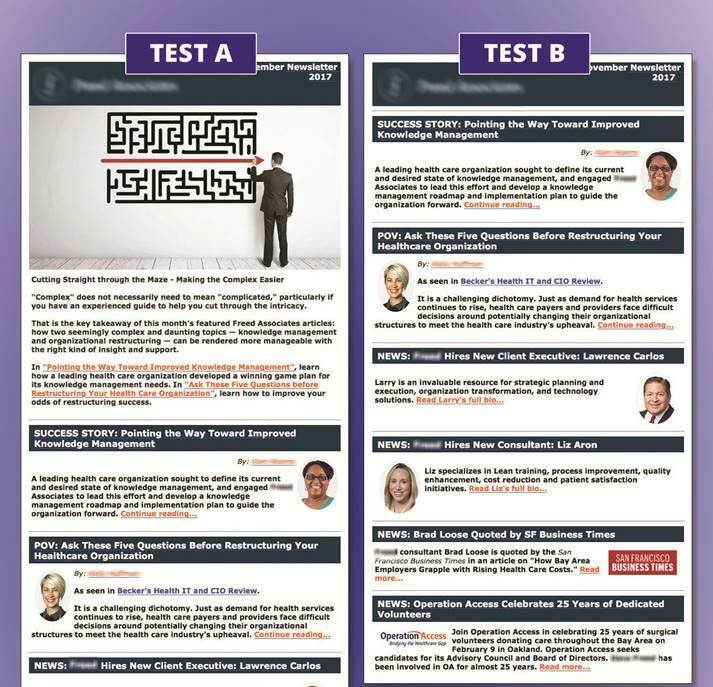 One thing we’ve learned in over 20 years as an email marketing agency, managing email campaigns and regular e-newsletter sends for clients, is that assumptions and opinions don’t matter—testing matters. When exploring why a campaign or e-newsletter isn’t performing to expectations, we find that everyone in the marketing department has an opinion on the things they think will get a better response. We invite that input, but often we find that the things people think will work don’t always pan out. Ideas for one particular B2B client’s e-newsletter included adding a splashy big image at the top, making subject lines “snappier,” and including an introduction to “lure” the readers in. We tested each of the ideas and will share the results with you below. Some of the ideas worked and some didn’t. And, admittedly, some of the results surprised even us veterans here at the agency. The bottom line: testing assumptions trumps instinct and opinions every time. Read on to see what we learned. 2. The big banner image at the top hindered response. Our client started their email template out with a very large banner image at the top with the articles below the image. The image was so large it took up nearly all of the preview pane of the email. We suggested removing the image or move it to the side, so that more article content appeared higher up. We were met with hesitation—they thought the image made the e-newsletter feel friendlier. From testing with other clients we knew that making the image shorter, so that more article content would appear in the preview pane, would improve results. So we advocated to at least make the banner shorter. Making this adjustment did increase click-through on the articles. But we were not satisfied. We suspected that having a banner image at all was an impediment to response. So later we did another A/B test. Test A had the banner image. Test B had no image, just the introductory copy under the company name and logo. Victory! 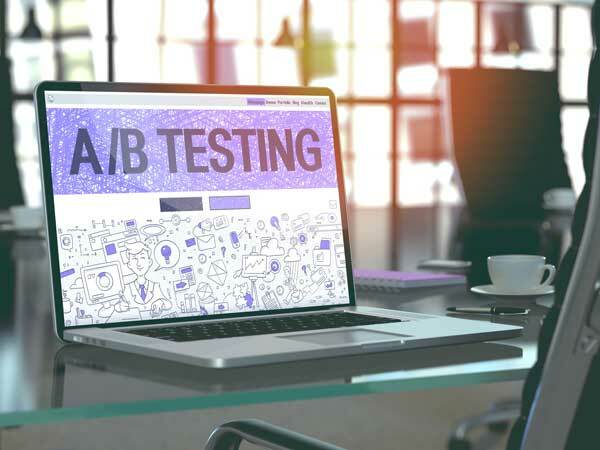 The results were as we predicted, test B had a significantly higher click-through rate. After a couple of re-tests, the large banner image at the top was eliminated altogether. See Image 1 below. Image 1: Test A had the big banner image at the top and Test B did not. Eliminating the banner image increased click-through rates significantly. This fits in with tests we’ve run with other e-newsletters and regular emails. Because B2B email is often viewed on Outlook, which blocks images by default, images are rendered as a white box with a red X until they’re downloaded by the reader. This creates a significant obstacle to the reader to find useful or interesting content in the email and ultimately suppresses click-through rates. Having smaller images, or no images, allows more of the text content to appear higher in the email, thus inviting more clicks. Also, downsizing or eliminating images helps when viewing emails in mobile, so that more e-newsletter article content can fit into the top of the view port. 3. An introduction at the top of the newsletter didn’t help response. Once we had dealt with eliminating the banner image on our client’s e-newsletter, we wondered if their long introductory copy to the articles was necessary. Our client was of the opinion it was too abrupt to just offer the articles without a banner image and certainly without an introduction. We asked if we could do a test. 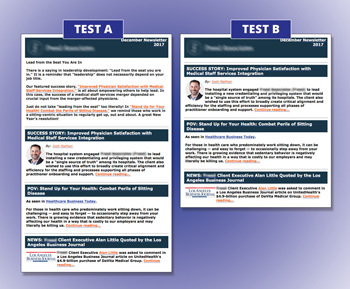 Test A had the introductory copy at the same length and type of content as always. 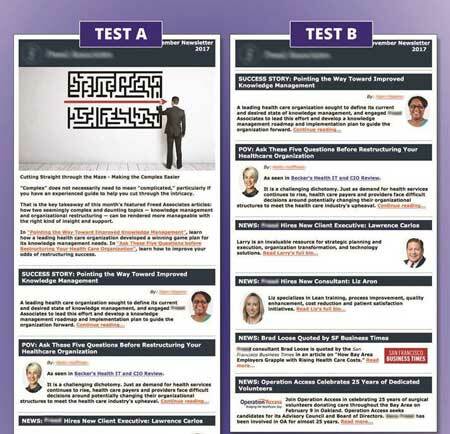 And Test B had no introduction—just the articles with the first one at the top under the logo. Test B did so much better it even surprised us. So we proposed re-testing this a couple of times on subsequent e-newsletter issues. The same results came in each time. We have a theory on this. When people are scanning their inbox, they’re looking for quick hits, things that need immediate attention, or articles that quickly pique their interest. The introductory paragraph may have pushed the article content down too low and hindered folks from getting to the article content promised in the subject line. And on mobile, it pushed the first article below the first view port. See Image 2 below. Image 2: Test A included an introductory paragraph and Test B had none. Eliminating the introductory copy allowed more article content to show higher in the email and thus resulted in more clicks on the articles. 4. A subject line hinting at multiple topics did better. The subject line in test B was a definite winner in trying to improve open rates. These multi-topic subject lines have increased the open rates of the e-newsletter even more and have now become our default. Though we must caution that if the article content isn’t interesting, that can be a game-stopper. On occasion we’ve had a strange dip in open rates. We attribute this to lack of interest in the topic itself. So we’ve been trying to mitigate this by reviewing web traffic on the blog to make sure the article content is getting broad traction before we put it in the e-newsletter. 5. People really like news. We added a News section at the bottom of the e-newsletter somewhat as an afterthought. Our client had been mentioned in a Business Times article, and one of the consultants had been interviewed by an industry publication. Also, a few new employees had been added to the team. Wow were we surprised at how many clicks these news articles received. Even though they’re not mentioned in the subject line, they often get more clicks than the articles. We have found this to be true on LinkedIn posts as well. Company news often gets more likes than informational articles. People really like to know what’s new about you, and that may rise above their interest in anything else you have to say. 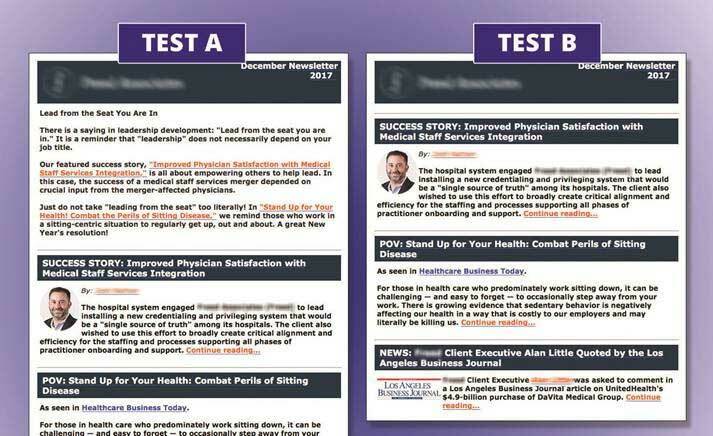 Assumptions and opinions may have been a good starting place for this client’s e-newsletter, but testing helped us dramatically improve results. We learned that big images can interfere with your text content, so make them small or push them to the side. People are skimming your email, so make sure they can get to your article content right away without any obstacles or belaboring with introductions. The more you hint at your content in your subject lines, the more opens you will get, as long as the topics are interesting. And don’t forget to satisfy those news hounds with information on what’s happening at your company. All of these tried and true ideas will get you more opens and more clicks on your e-newsletter. Need help with your email marketing? Review our email marketing and marketing automation service offerings here. By Laurie Beasley, Co-Founder and President, Beasley Direct and Online Marketing, Inc.
One thing we’ve learned in over 20 years as an email marketing agency, managing email campaigns and regular e-newsletter sends for clients, is that assumptions and opinions don’t matter – testing matters.